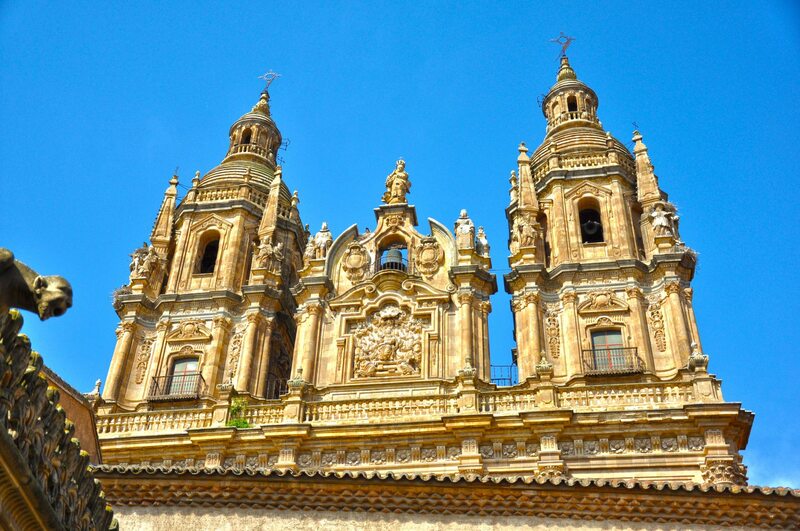 A city located on the northeast part of the Iberian Peninsula that bears great historical importance to Spain. 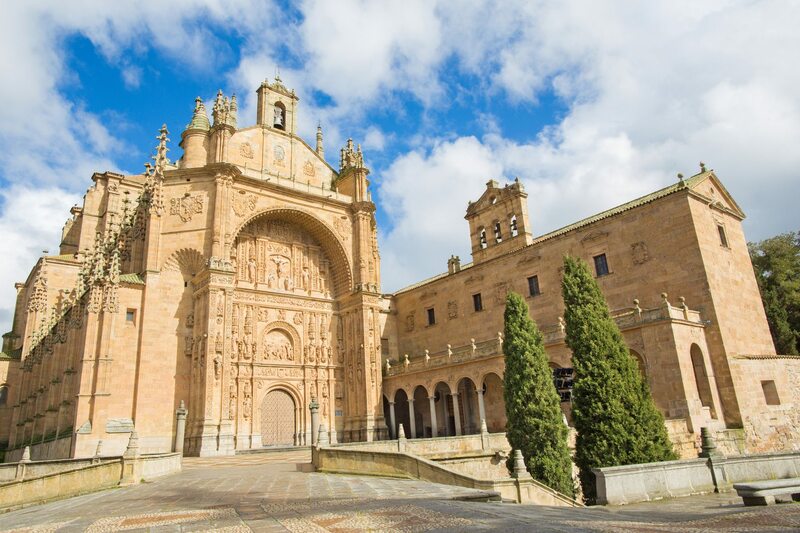 Here you will find the oldest university in Spain, the University of Salamanca, being one of the most prestigious places to learn Spanish and other subjects. A youthful spirit surrounds the historical parts of the city that contains 30,000 students. 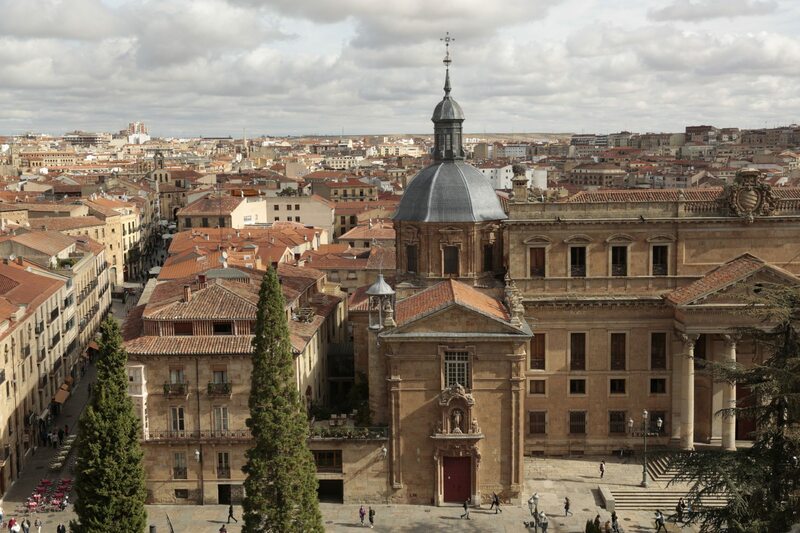 One example is the old town of Salamanca declared a World Heritage Site by UNESCO (United Nations Educational and Scientific Cultural Organization) in 1988, where in its heart lays the Plaza Mayor. With all types of shops and restaurants, it is the ideal location to admire the city during both the day and night after visiting all of its monuments. Rodrigo city is a city that has remained nearly untouched for thousands of years. In its interior are traces of the Stone and Bronze Age, and the roman civilization, like the “Three Columns”, which serve to guard the city. Declared historically artistic in 1944, it towers above the castle, constructed in the 14th century, which in actuality is an inn and local festivals, like the “Carnival of the Bull” and “The Charrada”, which merge in its music and tradition. La Alberca is a unique village in Spain. It is the first rural town to be named a National Historic Monument, because it appears as though time has not passed in the village. The major social activities continue in the main plaza, and many of the townspeople wear traditional apparel. Among its monuments is the Chapel of Humiladero , the Chapel of San Blas, or the Church of Annunciation. It is a village full of legends just waiting to be discovered. The “Sierra de Francia” is incorporated in various routes and towns in Salamanca. Between them is “San Martin del Castanar”, a township that transports us to the Roman age, where in August they celebrate their local celebrations. Another example is the “Miranda del Castanar”, which has a castle that dates back to the 15th century. Hiking on this mountain range is to discover what life would be like for the inhabitants of past centuries. Roman road links Mérida (Extremadura) and Astorga (Castilla y Leon). 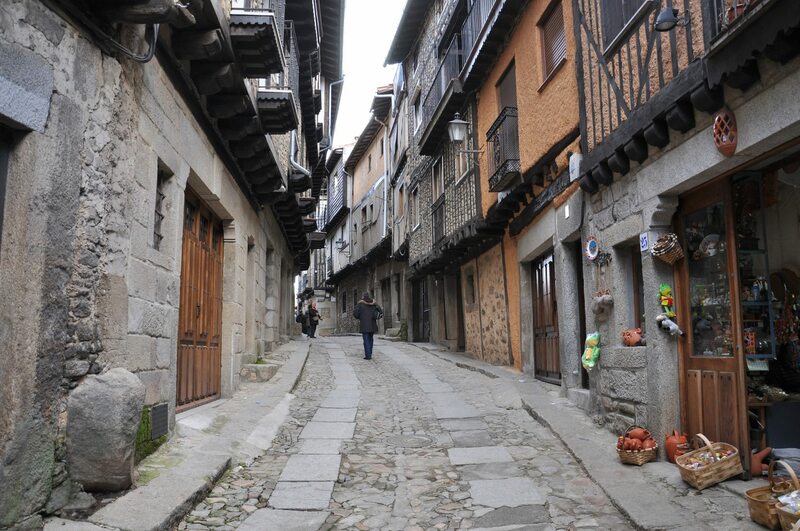 This is one of the favorite routes for pilgrims en route to Santiago de Compostela. Throughout the journey, the pilgrims are able to contemplate Roman works and the natural zones that surround them. During the Way of Saint James “The wine bucket of the land” which it is characterized by a village full of flowers and consist of excavated cellars of house made wine. This great natural landscape is called “the zone of special protection for birds”, which began in 1900. 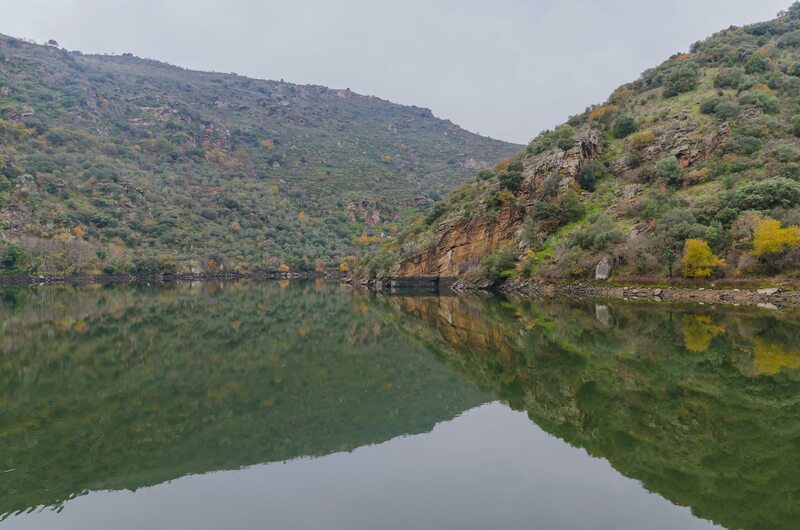 With more than 300 species of vertebrate, 20 species of fish, and an ample spectrum of vegetation; “Los Arribes del Duero” is a fantastic place, and leaves visitors amazed by the plentitude of nature and how they coexist in it. 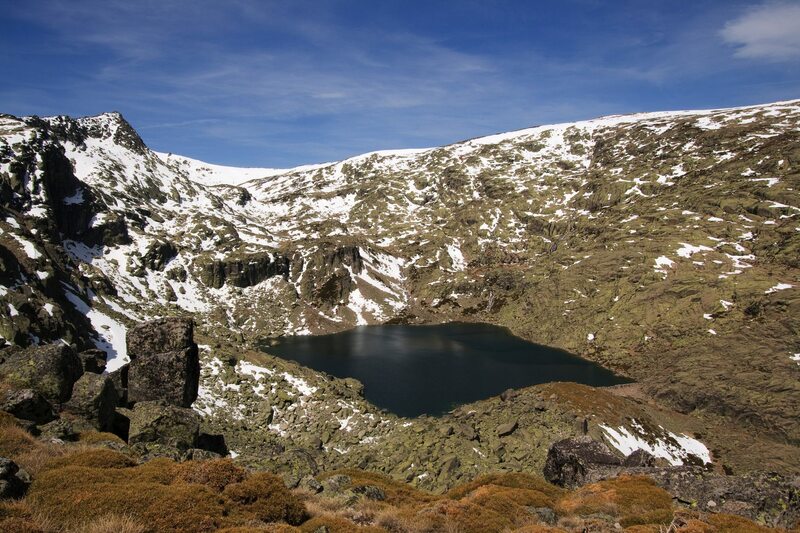 The “Sierra de Bejar” is one of the most visited moutainous zones in the “Sierra de Gredos”, for the lovers of snow. In its interior, is ‘La Covatilla’, which is very popular a ski station for those who practice this sport. Also, the ski station has numerous stores and cafeterias on site. Overall, this is a perfect place to spend a stupendous winter day. This museum, which opened in 1993, reflects the bull-fighting tradition in the province of Salamanca, by means of contributed objects by sector professionals or either by individuals. Moreover, they put on galas and activities in order to spread the legacy of this foundation. 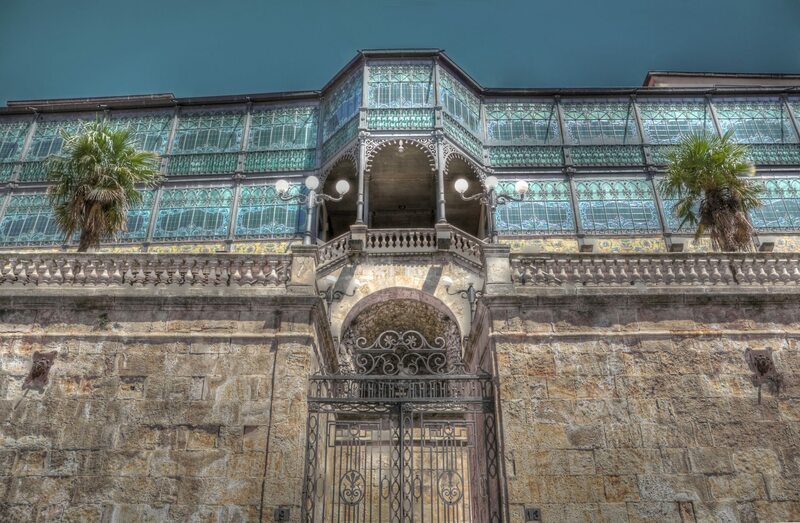 The “Casa de los Doctores de la Reina” recieved its name by having belonged to a doctor of the Catholic queen and her daughter. 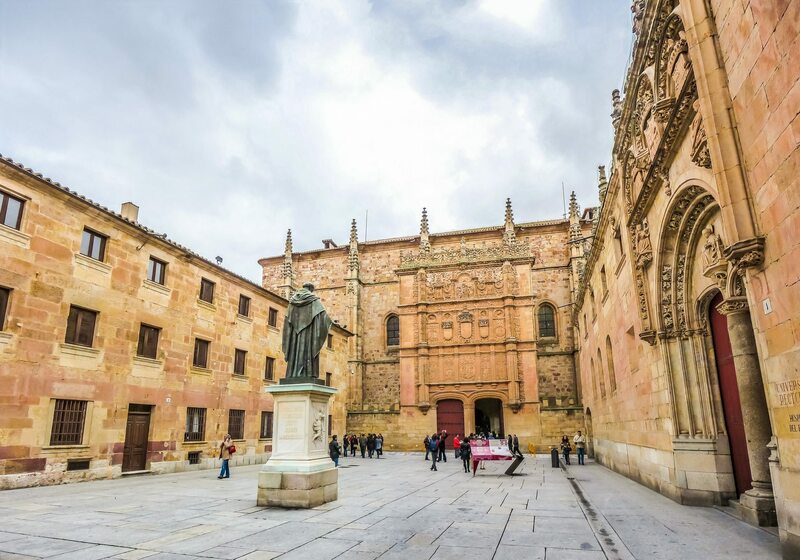 It was declared a historical and artistic monument in 1921, two decades after it becomes the museum of Salamanca. In its interior, one can contemplate flamenco and Dutch paintings. Specifically, it is notable to highlight the works “El Descendimiento” by Luis Morales and “San Andres” by Juan de Flandes. This building was built in the Baroque style, which was first built as a hospital for newborn babies, subsequently conceiving the guard of general Franco, from 1998 it was converted into what we see today as a center for documentaries. Its function is twofold: facilitate consultations to the citizens about the public archives on the Civil War and the task of the conservation and diffusion of one of the most important historical heritages in Spain. This museum is the first of its kind for automobiles that is open to the public in Spain. It contains a collection from the General Management of Traffic and bibliography archive. We can see the evolution of the automobile from its first conception in the 1st century B.C to the future. This is highly recommended to lovers of engines and motors. The entire city has a love of literature. This museum located in the home of the writer and philosopher Miguel de Unamuno during his work as dean of the University at the University of Salamanca (1900-1914) and his conversation is part of his cultural heritage, which was distributed between the museum and library. Moreover there are various activities in order to highlight the legend of one of the most illustrious men in the history of Spain. The “Casa Lis” is a small palace built in the modern style. It was constructed in the beginning of the 20th century, which illuminates its Art Nouveau decoration. From 1981 it has functioned as a residence, later it belonged to the city hall of Salamanca, actually being the Museum of Art Nouveu and Art Deco. With a whopping collection of decorative arts (works of glass, chryselephantine, and bronze), this is the best public collection worldwide of dolls, among others. This park whose name came about because it was constructed on a Jesuit property, is frequented by those who enjoy participating in sporting activities. It has a playground, a bike lane, and much more. 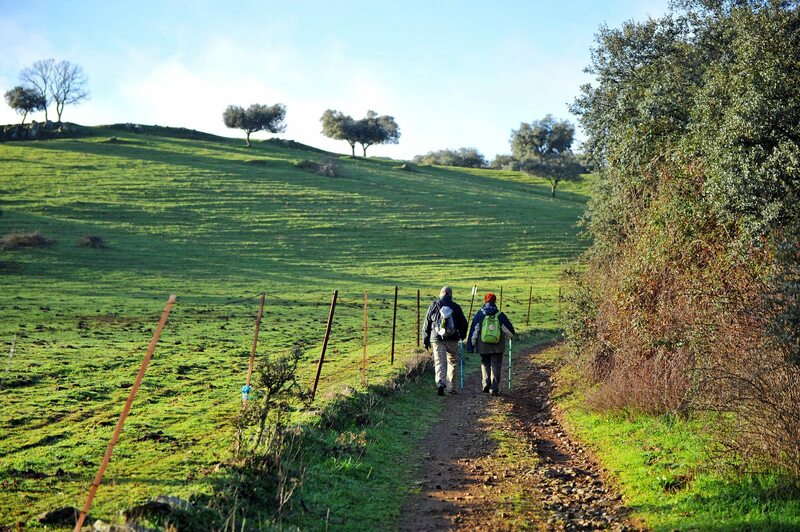 Moreover, it is important to take a walk through the natural area and gain a new perspective on Salamanca. 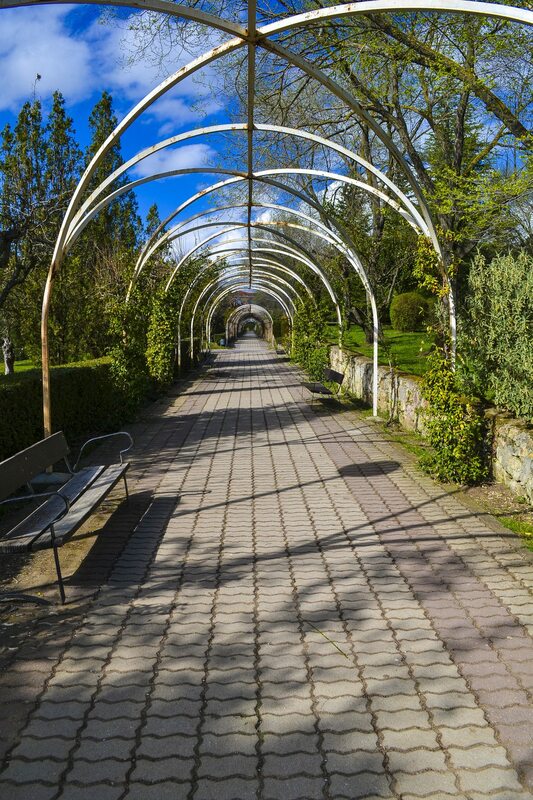 In the interior of the city of Salamanca you find natural areas, like the park of Alamedilla. Families visit this park very frequently, because of this many pass through and are able to disconnect from the routine of their walks. It is important to visit the artificial lake with weeping willows which surround it. 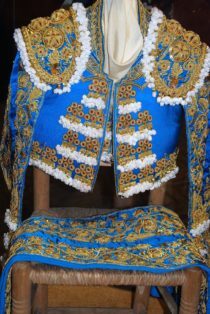 “El Ofertorio” is a traditional festival, which is celebrated every August 15 in the province of Salamanca. 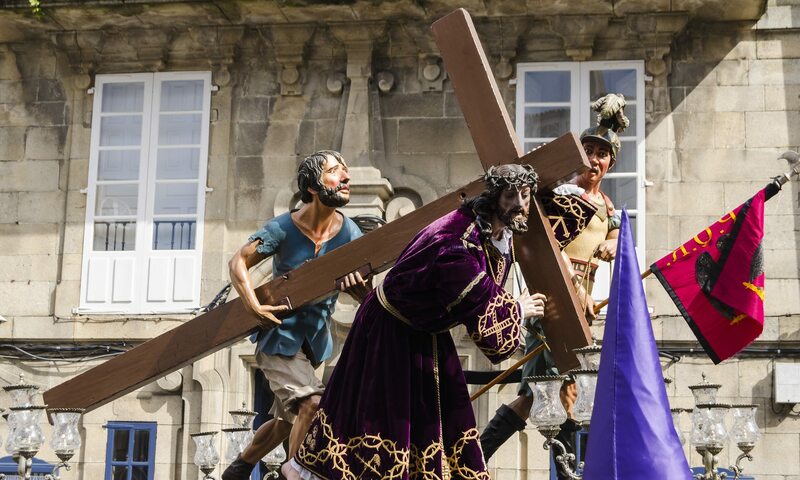 This festival gives tribute to the Virgen de la Asuncion in the main plaza of each town. Through offerings and dances, the clothing of the population is the main attraction. Moreover, the next day is “La Loa,” in which the new neighbors dress up as angels and demons in order to represent the fight between good and evil. Regional festivals are very important in order to understand the history of a city. The “Corpus Christi” is a religious celebration, which is celebrated in the entire country. However, the village of Bejar in Salamanca province relates it with the tradition of the “Hombres de Musgo” Men of the Moss, which is based on the Christian reconquest of the Muslim territory that was covered in moss. Furthermore, there are multiple activities like theatre, conferences, and competitions. “Lunes de Aguas” is a festival which has been celebrated since the 16th century, which involves spending time in the outdoors with friends and/or family in order to spend a full day in nature. Everyone brings food and drinks in order to disconnect from their typical routine. This festival is exclusive to Salamanca. 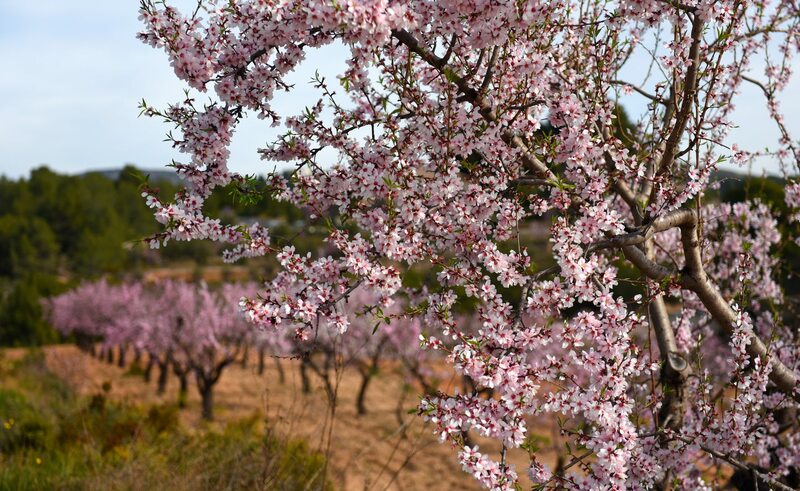 This festival celebrates the beginning of the month of March in the town “La Fregeneda” and announces the return of spring with the radiantly blossoming local almond trees. During the celebration, various ceremonies are performed, including literature and photography in order to make this day very special. Overall, it is a day of entertainment for any type of audience. The convent was first built as a church in 1256, with the main objective to be a center of technological studies, and to this day continues as a school. Moreover to walk in its interior is to realize one more time the importance of education in Salamanca. One can see the library or the Dominican Historical Institute with its archives which provoke great interest. A clergyman, Diego de Anaya y Maldonado, who was preoccupied in the collection of knowledge, established this palace. The building is of the neoclassical style, developed by its principle façade, in which there is a clear Greek style. In actuality, it is home of the Faculty of Philology of the University of Salamanca. 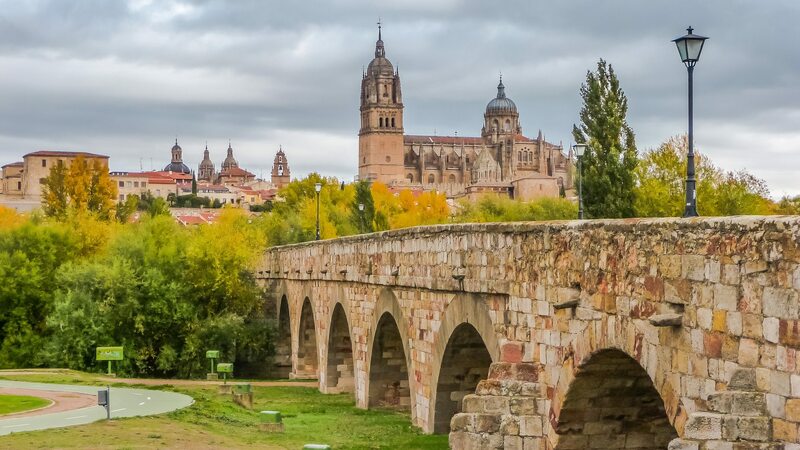 It is an ideal place to discover the importance of Salamanca in the academic world. “La Clerecia” is a church that is found in the interior of the Royal School of the Company of Jesus, it is both a school and a residence. It took 150 years to construct this place; however the splendor that one finds is unmatched. 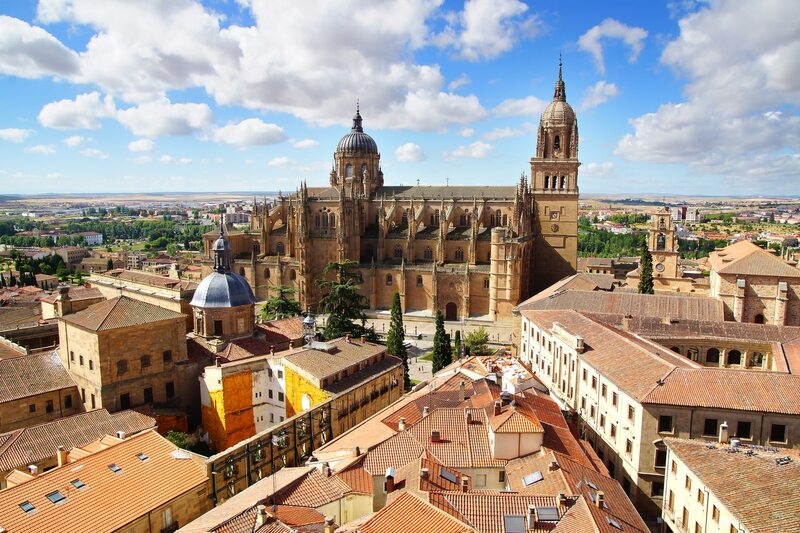 Moreover, it is located in the highest point in Salamanca, and therefore the views from the towers are truly magnificent. “La Casa de las Conchas” The house of the shells is a very unique building in the city of Salamanca. 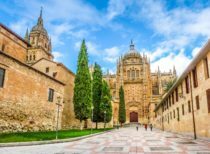 Despite belonging to the gothic style, like the majority of the monuments in Salamanca, it possesses elements of Spanish and Muslim. 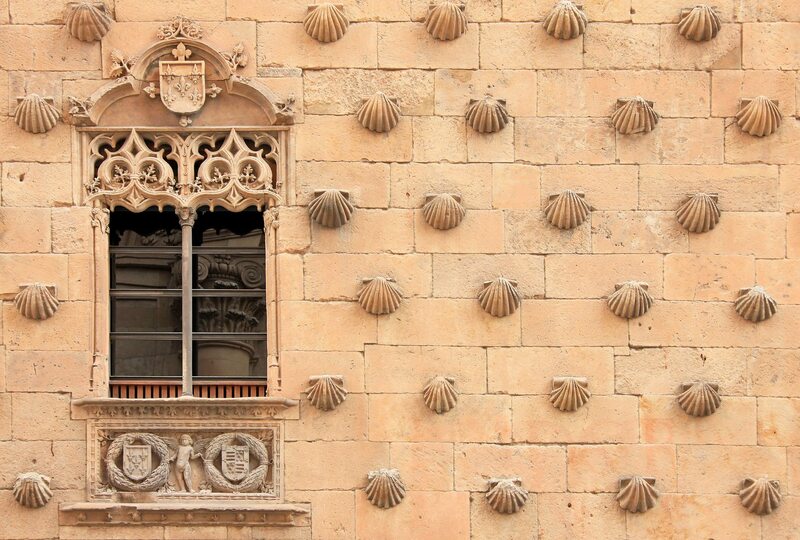 The most striking is to observe its facade, which contains 300 shells of “Santiago de Compostela” Saint James that according to legend, behind one there is treasure in ounces of gold. 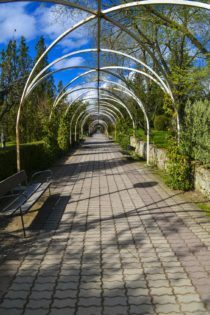 This Roman bridge belongs to the “Via de la Plata” Way of the Silver (Roman road linking other parts of Spain), it is 176 meters long and is one of the most visited places by the habitants of the city and tourists for running, taking photos, and contemplating nature and the beautiful views of Salamanca. 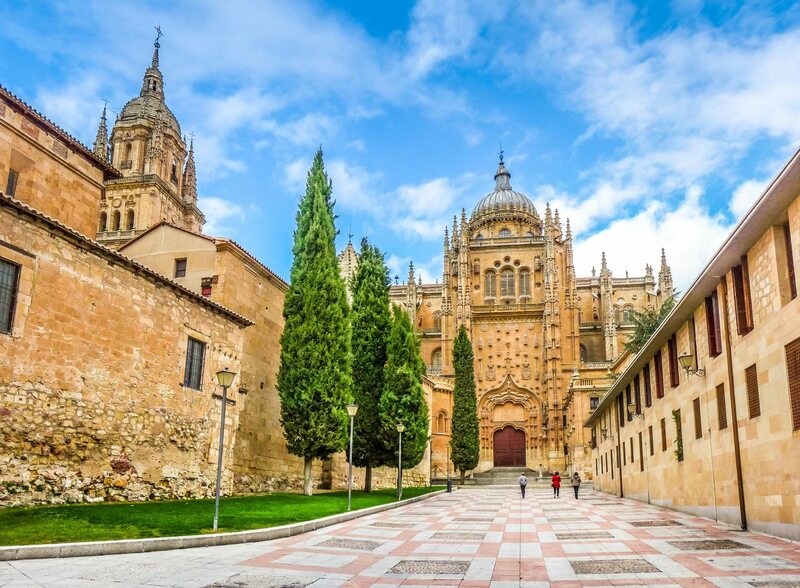 The University of Salamanca is the oldest university in Spain. Through its classrooms passed very influential writers like Fernando de Rojas, Luis de Fongora or Calderon de la Barca. In its interior, the collection of 40,000 books written between the 16th and 18th century is highlighted in all languages and subject matters. In its exterior, it is recommended that one observes the façade that dates to the 16th century, and was a work of the teacher of Plateresque Spanish. It is said that if one spots the frog perched on the skull, it is a symbol of good luck for any college students. This plaza dates from the 18th century by Alberto Churriguera. It is characterized by its baroque style, yet abundant ornamentation. In its interior is found the City Hall of Salamanca, about which are four allegorical sculptures of the industries of agriculture, music, and poetry. It is a plaza that recently is key for the European academics and the rest of the world. This is because once a year they join and celebrate the International University New Year’s Eve. This cathedral was constructed with the intention of replacing the old cathedral. However, due to the long process of construction (250 years), both are still standing today. This work of architecture of Gil of Ontañón, is one of the last small samples of the Spanish Gothic. The most impressive to see in the interior is the organs from the 16th and 17th centuries and the “Cristo de las Batallas” Christ of the Battles, called Cid Campeador. This cathedral (the first in Salamanca) was constructed between the 12th and 14th centuries. In the interior contemplate the altarpiece of the brothers Deli, one of the few works conserved by these authors in the world, showing various episodes of the History of the Salvation. It was constructed in the Roman- Gothic style, and was declared a national monument in 1887. 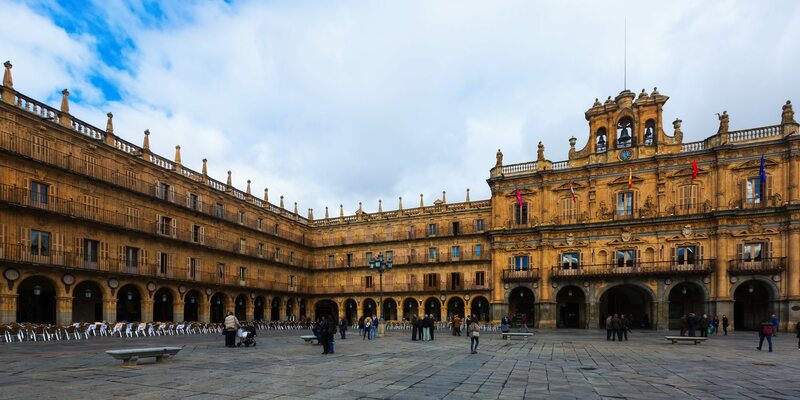 Salamanca is well-connected with the rest of Spain and Europe thanks to highways, trains and even a small airport. The closest international airport is Madrid-Barajas. The Bus Station of Salamanca has a multitude of connections between the providence´s cities, on a national level (Cádiz, A Coruña, Badajoz, Madrid, etc. ), as well as international (Bordeaux, Hamburg, Hannover, Lisbon, Zurich, etc.). On the inside there is a bakery, café, and gift shop, among other things. The train station is located approximately 12 minutes from the University of Salamanca. It has connecting trips to other provinces of Castilla and León, in addition to Madrid. The aiport is located 15 kms from the city on the military base of Matacán, and the available flights travel to Palma de Mallorca, Barcelona, Málaga, Menorca, Gran Canarias, Tenerife y Lanzarote.